With multiple cats in our home, changing the litter boxes can be a royal pain in the you know where. We have 4 litter boxes, which are strategically placed around our house. There is one in the living room, one in the library, and 1 in each of our 2 pantries. 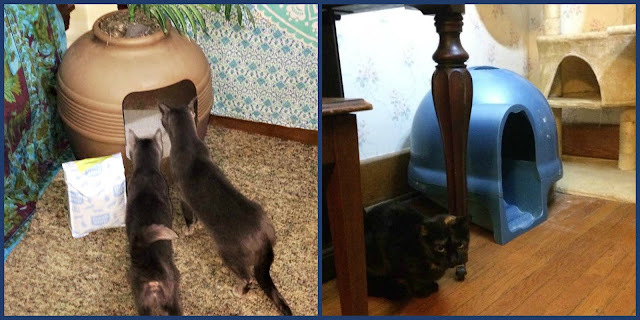 We try and space them out quite a bit, since our cats don't like to be crowded when they do their business, and no one likes waiting in line. Sounds a lot like people, right? Lugging around a huge box or pail of litter can be more than a little awkward. I usually have my soon to be 17 year old son do litter duty, since he's a strapping young man and can handle carrying around heavy things. He doesn't mind, and only gripes a little. Can you really blame him, though? No one thinks lugging around 40-ish lbs. 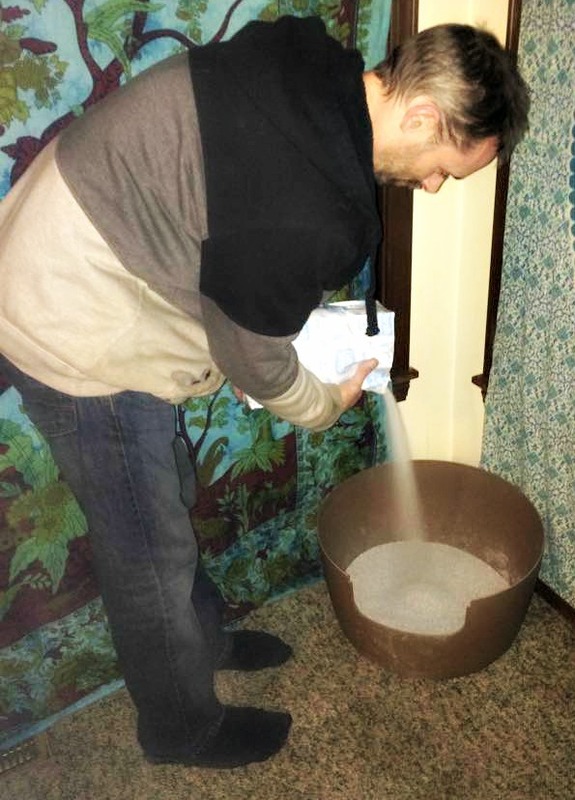 of cat litter is fun. I know I don't! 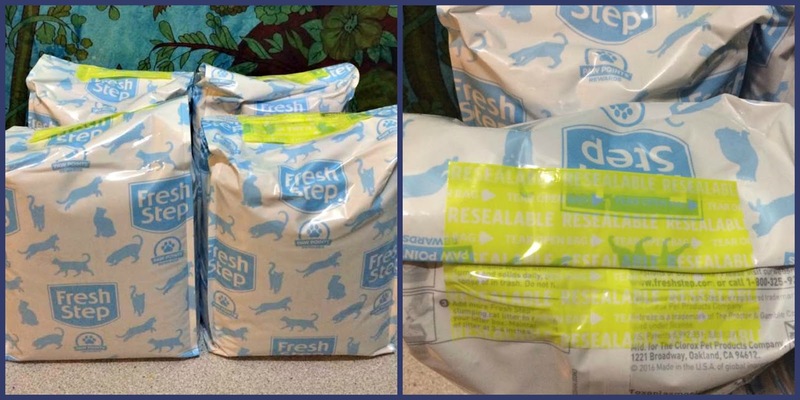 That's why I was super excited to learn about the newest cat litter in the Fresh Step® line up. Fresh Step Compact Packs offer 34 or 38 lbs. of litter, but instead of being in a cumbersome pail or box, they are separated into easy to carry packages. Why didn't someone think of this sooner?! The Fresh Step Compact Packs features the equivalent of a 34 or 38 lb. box packaged in four smaller packs designed to make the litter experience more convenient. The Compact Packs are better designed to store in and around the home, and easier to pour into the litter box. It’s perfect for homes with multiple cats (and multiple litter boxes), not to mention easier to store for apartment dwellers and those without a lot of space. Fresh Step Compact Packs will be available at your favorite retailers in March of this year, but we got to get a little sneak peek. This new litter comes in 3 great formulations, so you're sure to find the perfect litter for your household pets. 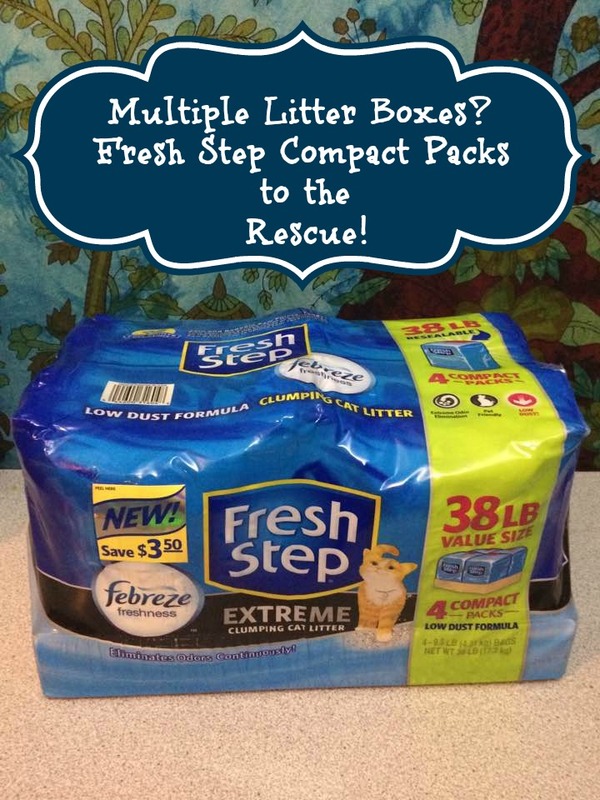 We received the Fresh Step with Febreze Extreme to try out with our kitties. We love this formulation, and find that it helps keep our house fresher, even with 6 cats doing their business here. The Febreze freshness definitely helps to minimize any kitty-funk. This is a HUGE plus, since litter boxes can smell pretty darn nasty at times. The first thing we noticed about these packs were their size. They are incredibly compact, making it easy to store them almost anywhere. You can keep them in a cupboard, closet, pantry shelf....Anywhere, really! They do not take up a lot of space, so it makes organizing easy and painless. These packs are also very easy to open and pour. Since the packages are smaller, there's less chance for spillage, and there's also less dust kicked up than while pouring from a larger container of litter. Pour a little in each box, or add an entire Compact Pack to one box. Either way, there's no more lugging heavy boxes from room to room. Our cats are already used to Fresh Step litter, so there was no protest poops to be found when we switched to this litter. They were, however, curious about the new little packages. Check out Mary Jane and Cheeseball scoping out their freshly filled litter box! In the next room, Truffles can be seen hanging out, waiting her turn to "go". She's one of my more polite cats, and doesn't mind taking turns. Overall, we're definitely very pleased with this innovative new solution to litter woes. Fresh Step Compact Packs are easy to carry, easy to store, and easy to pour. Whether you have multiple cats and litter boxes, or a smaller living space with lack of storage, definitely check out these awesome new litter packages from Fresh Step. They certainly make life easier and changing the litter boxes a lot less painful....Literally! 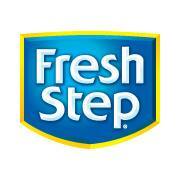 You can connect with Fresh Step® on their website. While you're there, be sure to check out Fresh Step® Paw Points Rewards Program. This awesome program allows you to earn points redeemable for Fresh Step Litter, cat toys, and more by taking surveys, sharing photos of your feline friends, and for recording your Fresh Step purchases. It's fun, and best of all, these perks are absolutely FREE. You can also connect on Facebook, on Twitter, and on Instagram. 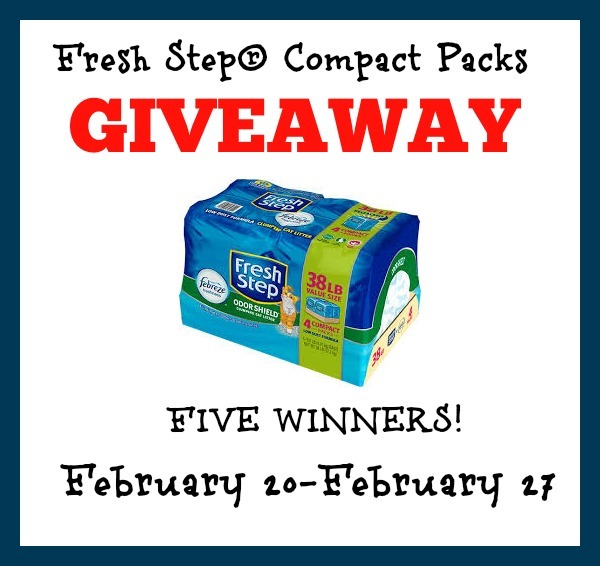 I am thrilled to announce that FIVE lucky readers will receive an $18 Fresh Step coupon to try Fresh Step Compact Packs for themselves! Yes, you read that right....FIVE people will win! This giveaway is open to US Residents 18+ until 11:59PM EST on February 27, 2017. Winners will be drawn using Rafflecopter's Random Number Generator. All entries will be verified, so play fair! I will notify winner via e-mail and they will have 48 hours to reply before I am forced to redraw winners. No purchase necessary. Void where prohibited. This contest is not affiliated with Facebook, twitter, Pinterest, or Instagram in any way. Participating bloggers are not responsible for prize fulfillment. If you have any questions, please contact Brandy at newlycrunchymamaof3@gmail.com Thanks for entering, and Good Luck! All 3 of our cats are different. I love their quirks an personalities the most. One has Cerebellar Hypoplasia, his condition makes him clumsy and he walks crooked. I call him sidewinder lol. I love them all though! My cats have unconditional love. I love how she just loves to be by me. No matter which room I go into she will come to keep me company. I love how much my cat (Huey) loves to cuddle. They are pretty funny to watch. We have 3 and they just run around like crazy chasing each other. I love that my cat recognizes that each family member has their own personality and he acts differently with each of us. I love it when my cat jumps up on my lap to nap and purr. I have two grey tabby brothers that are very intelligent and affectionate. They make the best buddies to each other and me! I love that she's temperamental! LOL She meows for food and then when you give it to her, she swats at you! I love that our cats are part of the family with their own unique personalities. I love how mellow and easy going he is. I have 2 brother tabby cats and they love to wrestle and chase each other. I love that my cats are always there to greet me when I come home & they are so furry & lovable. I love that our cat is very gentle with everyone, especially the kids! I love that our cat is gentle with everyone, especially the kids! My cats follow me wherever I go around the house. Our cat seems to be descended from mighty hunters. She loves to track mice on my computer screen, pounce on her toys, and chase laser pointers. She's a very cool cat. I love how she sleeps with me at night. My cats are very curious about anyone that comes to visit and have to smell them and purses or backpacks. I love how funny they are and how much they love me. Cuddles, purrs and she makes me laugh. Both my cats are so soft and love to be petted. I love how one of my kitties is like a puppy. Always in my lap and sleeping on me. I love the different personality of each cat. My cat loves to rub and purr. He also loves to play so we play with him alot. My cats get along with everyone that comes to visit. No bug, lizard or frog is safe in my house with these 2 hunters! My baby Oskar is a cuddle bug. I love how my cat winds around my legs and purrs. We have 3 cats. I love how they all have their own unique personality. I especially like how they jump in my lap and curl up to take a nap. I miss having a cat. I'm winning this for my friend who has 2 cats.